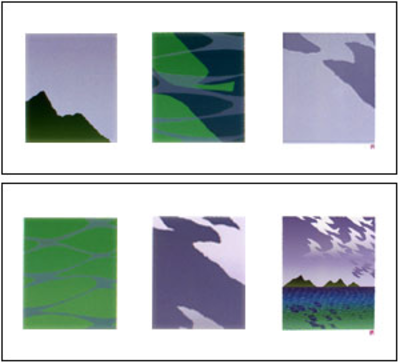 This diptych, divided into horizontal panels, each with its own title, number and signature, can be hung over each other as pictured, or side by side. For the first time, I generated an image almost entirely electronically. In other words, there was no prototype collage, painting, or woodblock print. I did have a scrap of paper with a fish cut out of it, and a torn scrap that suggested bird or cloud. I also had an old drawing of a wave pattern I had never attempted to cut out of wood. Jon Cone was able to solve each challenge I posed for him, and we created the image of the Aeolian Islands as I imagine them to be. Then I used the cropping tool to exerpt details. Actually the process was far from swift, for I rejected the first proof we made and spent several months rethinking the project, after which I returned to Cone Editions and recreated the image with entirely new colors, composition and details. The title is the Italian word for metaphors and refers to the beautiful movie “Il Postino” which tells the story of how Pablo Neruda taught a young fisherman to see the connections between sea, sky, land, clouds, birds, fish… in other words, how to be a poet. Framed 24.5" x 53", Unframed 17.5" x 46"